We all know Jimmy Garoppolo isn't going to fill in the big shoes of Tom Brady in his first game but the head coach of their Week 1 opponents sees similarities with another star QB. 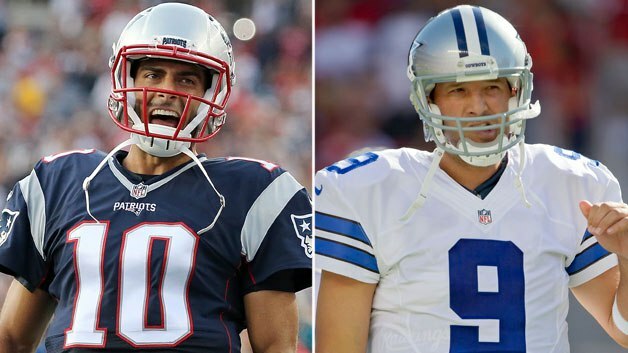 If Garoppolo could gain any of the success that Romo has been able too in his long NFL career, the Patriots could have a steal on their hands and a direct replacement for Brady when he eventually decides retires. Both these quarterback's entered the NFL coming out of Eastern Illinois with Garoppolo in his senior breaking Romo's school records for passing yards and touchdowns for the season as well as career passing touchdowns. Another trait the two share is their elusiveness which Romo has showed on plenty of occasions over his career in Dallas. On top of this Romo and Garoppolo share two of the quickest releases in the league alongside Aaron Rodgers and Marcus Mariota. It seems like that is what Eastern Illinois QB's are known for quick release and ability to evade would-be tacklers. Garoppolo hasn't set the league on fire in preseason but with these traits in his locker, there is a chance he can become the heir to Brady's throne in New England.